Merced River - Below Yosemite N.P. September 1, 2016 When fly fishing for surf perch - ORANGE is the new Black. July 10, 2016 Indian Creek Reservoir is stocked with Lahontans and rainbows where damsels emerge in huge numbers. 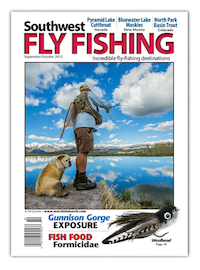 June 2016 Look for my photography on fly fishing California's Lower Yuba River in the June/July 2016 issue of FLY FISHERMAN . May 2, 2016 When Fishing Pyramid Lake You Pray for the Wind to Blow (unless you are in a boat). April 16, 2016 Some native redband are tucked away in the far upper right-hand corner of California. March 8, 2016 Is it any wonder why steelhead & anglers return to these epic rivers along California's North Coast each and every winter. March 4, 2016 As Spring approaches my thoughts turn to A High Desert Lake with Monster Lahontans. February 17, 2016 The California Godlen Trout is in Hot Water. Winter 2016 Look for my photography in the feature story The Complicated Relationship Between Beavers & Trout in the Winter issue of TROUT. 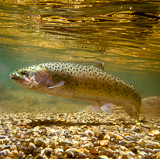 January 2, 2016 Steelhead and the importance of rain harvesting. 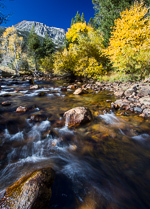 December 2015 Check out my photography in the article Die Gold Nuggests der Sierra Nevada. 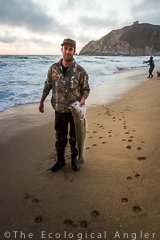 November 10, 2015 Read my latest story on the Smithsonian's Ocean Portal Surf Fishing in a Golden State. 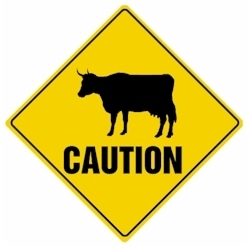 October 21, 2015 Read my story in the Earth Island Journal on the threat cows pose to California golden trout. September 21, 2015 A long awaited trip back to the Carson Iceberg Wilderness. August 18, 2015 In 1971, the California Wild Trout Program was created. The next year, 16 miles of the Lower Owens River got added. 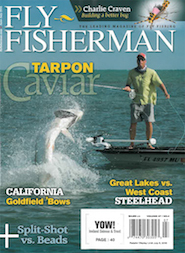 August 4, 2015 Wanting to fish through California's hot & dry summer? Hit the beach. August 2015 Crossing boggy, tundra meadows to fish for big bows and dollies in the backcountry of Alaska's Bristol Bay region. July 14, 2015 Dedicated to the heart & soul of California's trout streams - The Sierra Nevada Mountains. 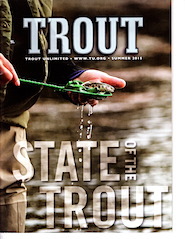 July 2015 Look for my photography in the cover story State of the Trout in the Summer 2015 issue of TROUT. May 21, 2015 Visiting the Ghosts of Lake Lahontan. May 6, 2015 A float down a Central Valley trib of the San Joaquin River reveals unexpected wildness from above and below. April 14, 2015 The Drought puts a HURT on the Walker. March 3, 2015 Pleased to report long-time friend & fishing-compadre Kurt Peterson is on The Board!!! February 8, 2015 The Trinity River shows a bit more of its wild side in 2014 - 2015. November 20, 2014 Feed by snow melt from Mt. Dana, this big creek in the Mono Basin has been harnessed for water and power, but is now getting restored. October 29, 2014 Heenan Lake 2014 - More Grabs & Less Green Stuff. And is the Drought to Blame or Praise? October 13, 2014 The EcoAngler travels north in search of Hot Summer Steelhead on the Lower Deschutes River. 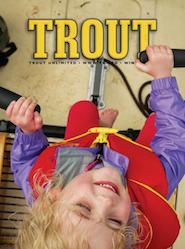 September 2014 Look for my photography on fishing for native golden trout in the September 2014 issue of Outdoor Life . August 26, 2014 Creating a Stronghold for Redband. July 17, 2014 A long-awaited return to Golden Trout Creek. June 12, 2014 The West Fork of the Carson River is popular road-side fishery not far from the blackjack tables of Lake Tahoe. May 6, 2014 An important bit of info if you are planning to visit the Clavey River. 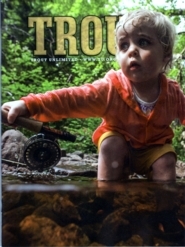 April 4, 2014 Look for my photography in the article Walking A Trout Tightrope in the Spring 2014 issue of TROUT. 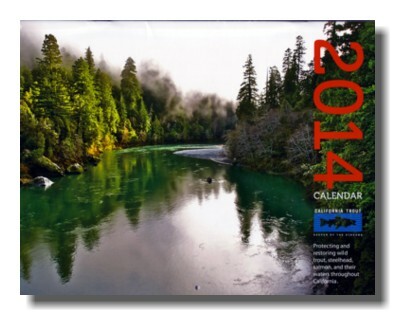 March 2014 A couple of my photographs were selected by California Trout for their '14 Calendar. March features a landscape of Hot Creek & April shows a native California Golden. 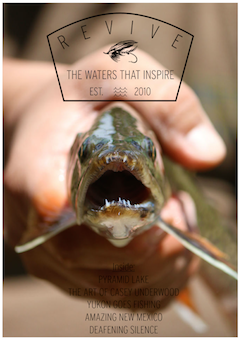 Please support the good work being done by Cal Trout! February 27, 2014 As drought settles over California - time to take a long and hard look at the state's water-supply crisis. February 4, 2014 Using Little Green Men to abduct trout from rivers throughout North America. 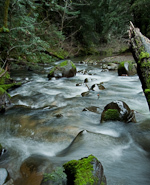 January 15, 2014 D-r-o-u-g-h-t spells serious trouble for coho looking to spawn on Central California creeks. I went Fishing for Science. December 15, 2013 A different kind of restoration story for the Holiday. Hope you enjoy and have a safe and Mer ry Christmas with loved ones. November 11, 2013 Like a bear following the smell of bacon into a big cylinder welded to a truck trailer, I came to learn the wonderful access and open back-cast of the Upper Owens River is a bit like the bear-trap. October 15, 2013 Yellowstone Cutt Country is the homeland to it's namesake trout, and a country under siege. October 3, 2013 The Ansel Adams Wilderness encompasses the headwaters of one of the finest wild trout rivers just east of the Sierra crest. 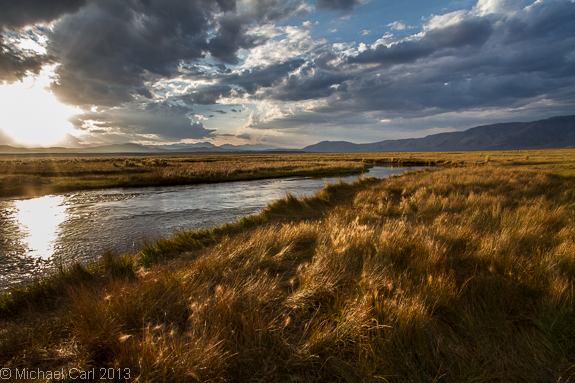 September 3, 2013 The Hard Fighting Cutt-Bows of the North Fork Shoshone River. August 21, 2013 It's not a stretch to say - Slough Creek represents the most popular trout stream inside Yellowstone National Park. August 8, 2013 Yellowstone cutthroats and time travel. July 24, 2013 In the Sierra Nevada, high elevation lake basins encircle rugged summits inviting the casting of a fly and the taking of a few pictures. May 31, 2013 A new installment of what I like to call the East Walker Chronicles. May 1, 2013 In the streams of Mother Lode Country, the big gold deposits may be played out, but treasures do still exist. April 20, 2013 The Nushagak River supports the largest king salmon fishery in North America, but by mid August, their smaller cousins start charging up this big river. April 1, 2013 Fly Fishing Southwest Alaska's Wood River and a major trib with a nice run of silvers. March 14, 2013 A look at Artic Grayling, and of course profiling its large doral fin. March 4, 2013 Fly Fishing an Alaskan Legend - the Agulowak River. February 18, 2013 The Great Salmon Place. January 28, 2013 California Heritage Trout Challenge Honor Roll has been updated. Mark Skawinski joins the Honor Roll with Certificate # 140. Mark has a 2nd CHTC application in the pipeline as well. Mark - thanks for supporting this site! December 4, 2012 Late October and November brought large amounts of rain and roe to the steelhead in the Trinity River. November 5, 2012 Guided by Captain Obvious, the EcoAngler explores a spot he's driven by and never stopped to fish in Yosemite National Park. October 26, 2012 Journyed over to the Eastside of the Sierras for a last taste of fall fishing on a small Sierra Nevada Creek. October 22, 2012 Well it's been a while since the California Heritage Trout Challenge Honor Roll has been updated. That changes today with the addition of Evan Eropkin and Matthew Hernandez. Great job guys, and thanks for supporting this site! October 8, 2012 When fishing, I like to set low expectations for the day. Such was my mindset recently when I joined up with my friend Don for a day of salmon fishing. September 25, 2012 When not dodging Bambi Buckets, managed a couple of good days fly fishing the Upper Sacramento River. September 20, 2012 A word to the wise - don't attempt to fish the Upper Sac when you see these huge bugs hatching. September 1, 2012 Putting the camera at eye level with some of the most aggressive hitters of a pink fly. August 27, 2012 Some real heavies can be found patrolling the Wind River below Boysen Reservior. July 17, 2012 Just below this iconic granite formation in the Carson-Iceberg Wilderness flows the Clark Fork Stanislaus River. June 27, 2012 It might be named after a Polish Saint, but this river is certainly no joke. 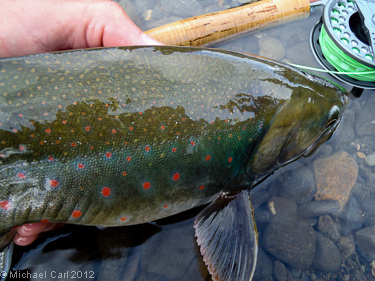 June 12, 2012 An amazing wilderness in California for native trout deserves a nice home on EcoAngler.com. May 30, 2012 Yellowstone cutthroats and time travel. 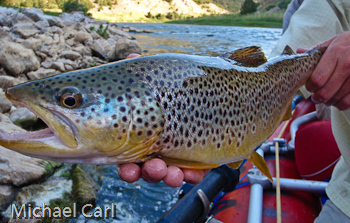 May 8, 2012 What exactly drives the abundance of brown trout below Flaming Gorge Dam on the Green River? April 30, 2012 Tuolumne River, Poopenaut Valley ... if you have hiked down to fish for wild brown trout here, you'll know why it's called Pooping-Out Valley. April 16, 2012 Bowl of roe by bowl of roe. 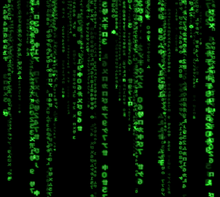 March 27, 2012 Unfortunately, no one can be told what The Spawning Matrix is. You have to see it for yourself. March 5, 2012 Your number is 3960. Please proceed to the spawning-processing-area. February 20, 2012 The rebuilding effort on Northern California's Russian River. February 7, 2012 Strange encounter on the Trinity this year... some guy (looked like Charlton Heston) was shouting from the banks something about the Soylent Corporation controlling steelhead production on the Trinity River. 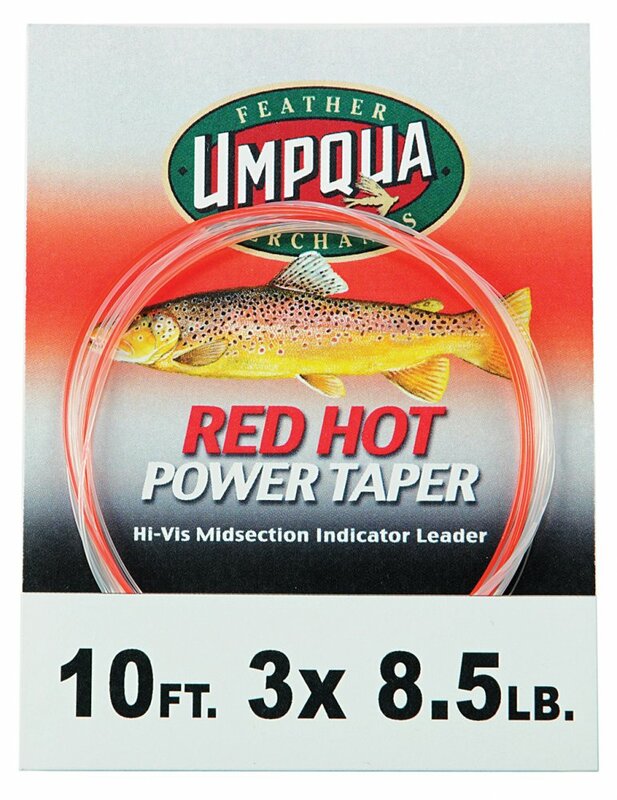 January 8, 2012 A contributed story from a reader of this site who fell under the spell of pursuing native redbands. December 21, 2011 Another native Wyo Cutt - Snake River Finespotted Cutthroat. November 29, 2011 The Dana Fork of the Tuoulmne River in Yosemite National Park can be accessed easily, has stunning peaks, and good numbers of wild trout. November 11, 2011 Kirman Lake holds brookies both big and small. November 1, 2011 The hopper bite ran late and finished strong on the East Fork of the Carson. October 31, 2011 What makes Hot Creek... run Hot?. October 26, 2011 Is the US Economy recovering? They're back in good numbers on Lake Alpine. September 25, 2011 Doubling back to fish the North Fork of the Stanislaus River. September 16, 2011 Posse Grounds and the Urban Rainbow - the evolution of the Egg Bite on the Sacramento River. 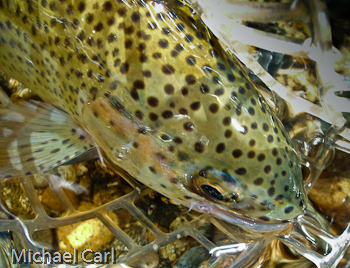 September 4, 2011 The 1st installment of Wyo Cutts leads off with Bonneville Cutthroat. August 27, 2011 The large snowpack in the Sierras gives this rainbow another year to out-stay his welcome on Silver King Creek. July 20, 2011 Got wood?. July 12, 2011 This Thursday marks exactly 20 years since the Cantara Spill on the Upper Sacramento River. 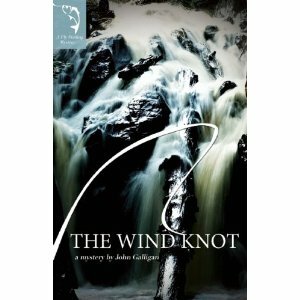 June 24, 2011 Wind Knot - A knot caused by bad casting... blamed on the wind. June 21, 2011 A short take on Mono Winds and Beaver Ponds. June 7, 2011 Just off I-5, runs Piru Creek - providing an easy escape just north of L.A.
May 19, 2011 The Little Walker River flows out of the upper Walker River Basin. April 22, 2011 Do rainbows get cold? 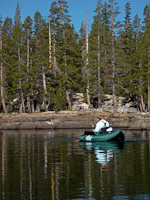 The EcoAngler heads up to The Merced River to conduct field research. March 2, 2011 109 percent of what would be normal, and it's wetter. 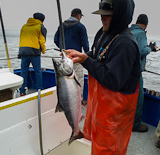 March 1, 2011 The number-crunchers at CDFG are predicting a return to salmon goodness for the 2011 coastal fishing seaon. February 24, 2011 My fishing buddy just emailed me this link. Bathtub-ring be GONE. February 20, 2011 Let the speculation begin. 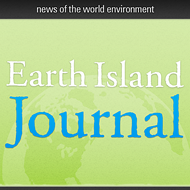 To what extent will there be a 2011 salmon fishing season? February 8, 2011 The 2010 fall chinook total return numbers are in for the Sacramento River. Better, but below the forecast and well below the historic average. February 2011 The report shows the 2010 fall chinook spawning totals on the Klamath River. Historically one of California's most productive. See how the fall 2010 stacks up against the past 10 years on page 2. December 18, 2010 Pescadero Marsh provides critical habitat to steelhead. Man-made changes and lack of action by the State of California have quietly lead to annual fish die offs. Times up... save the guns, just send the lawyers. 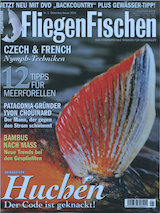 November 20, 2010 The pupa and adult form of the Giant Orange Sedge are popular with large trout and anglers alike. November 7, 2010 A California fly-angler, Ben Blankenhorn turned up a couple of natives on a trib to the North Fork of the Kern this summer. Great pics Ben! 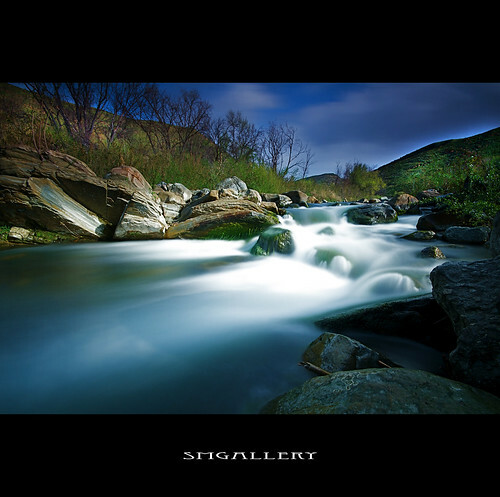 October 17, 2010 The Owens River ... the water that created Los Angeles. September 19, 2010 West Fork of the Walker River - likely considered the red-headed-step-child of Eastern Sierra Rivers especially when compared to the East Fork's tailwater. 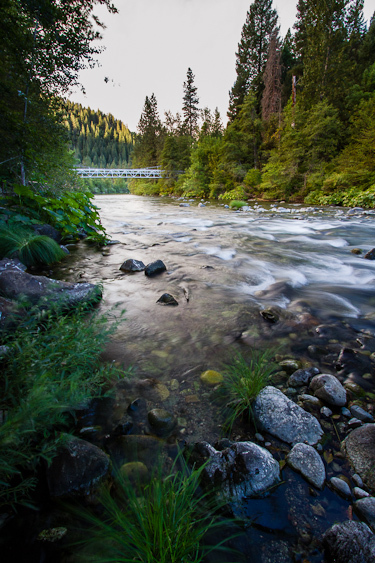 September 7, 2010 The flows are creating good conditions on the McCloud River along the Nature Conservancy Preserve. 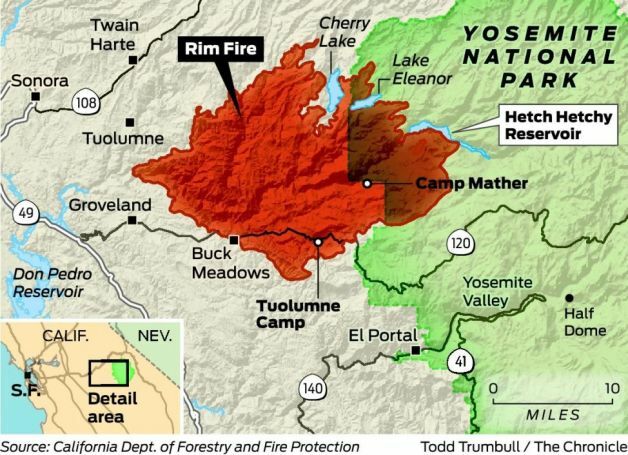 August 17, 2010 Another report from deep inside the Golden Trout Wilderness and Sequoia National Park. Fly fishing for native Kern River rainbows near the headwaters around Funston Meadow. August 10, 2010 C.D.F.G. Fisheries Biologists held a Heritage Trout Clinic . John Burge attended the weekend event in the Modoc National Forest and contributed a write-up with photos. 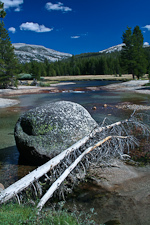 August 1, 2010 The western edge of the Emigrant Wilderness provides the headwaters of the Clavey River. July 12, 2010 The Golden Trout Wilderness encompasses the headwaters of South Fork of the Kern River - a refuge for sure. 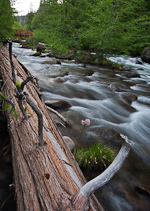 June 9, 2010 The EcoAngler explores Deer Creek in Lassen National Forest and the Ishi Wilderness. May 24, 2010 Received an email from Ned Morris (CHTC #3,57), looks like California holds another subspecies of redband. May 14, 2010 Time to feed the beast....fly fishing a Yosemite creek. April 28, 2010 A classic, high-country fishery in Yosemite National Park - Lyell Fork of the Tuolumne River..
April 18, 2010 Inspired by Trout Unlimited's Calendar featuring a California Golden Trout, I give you ... Golden Trout Creek. March 19, 2010 Westlands Water District - Can you handle the truth? March 15, 2010 An excellent behind-the-scenes look at how the Klamath River dam removal agreement came into existence and profiles of the locals who had the courage to agree. March 6, 2010 Op-Ed on water policy in S.F. Bay Delta and the need to think of local fishing economies impacted. March 1, 2010 The natal home to wild salmon and steelhead ...it's more than a clean bed. February 20, 2010 As native fish populations crash throughout California - time to take a long and hard look at the state's water-supply crisis. February 19, 2010 Over a year later, the signing of the Klamath Settlement Agreements signal the "beginning of the end" for 4 dams on the Klamath River - a turning point for native salmon. February 18, 2010 Op-Ed on Feinstein's misguided efforts to change water policy in S.F. Bay Delta. February 10, 2010 Good winter rains fill coastal creeks like this. The creek opens to the sea and attract big-fish-eater. February 3, 2010 Central California Coho Populations Continue to Crash. January 23, 2010 In 1996, his man connected-all-the-dots... published a report and no one in CDFG acted. Studying Salmon to death. 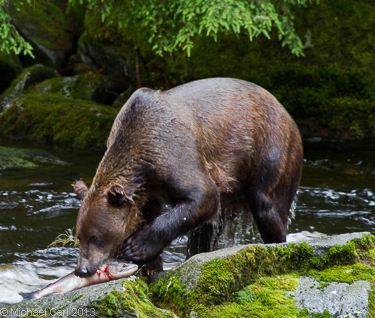 January 20, 2010 Death by a 1000 cuts - A summary of the California's Salmon crisis. 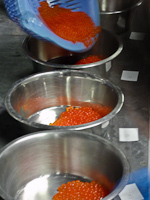 January 16, 2010 For Central Coast steelhead who want to experience fine-spawning in Carmel - your table is almost ready. The agreement to remove the San Clemente Dam on the Carmel River. January 13, 2010 What station are you listening to? 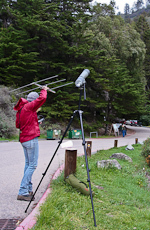 Photographs of California Condors soaring high above Big Sur. November 20, 2009 The EcoAngler attends the Junc Show on the Trinity River. November 12, 2009 Fall fishing on the Upper Sacramento River. October 19, 2009 The EcoAngler drops into the Forks of the Kern River for a closer look. October 5, 2009 Fishing the famous "rock-pile" near the Middle Fork of the San Joaquin River. September 21, 2009 At the headwaters of the South Fork of the Pit River, you'll find the Warner Wilderness . September 14, 2009 The yellow sallie hatch had peaked but the rainbows on the Kern River above Johnsondale Bridge were in denial. September 2009 Scud-eaters and cud-eaters are loose along the East Walker River . July 26, 2009 A small, isolated population of Whitehorse Creek Cutthroat quietly survive in the Coyote Basin. July 12, 2009 Underwater photographs of a Warner Lakes redband. 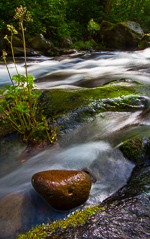 May 31, 2009 The North Fork of the Blackfoot supports a native fishery in a watershed of continual ecological change. May 5, 2009 Th e EcoAngler heads into Blackfoot C ountry. April 2009 And the winner for most endangered river of 2009 goes to... Sacramento - San Joaquin River System. April 6, 2009 The Lower Sacramento River flows through the center of Redding and supports a large urban population of rainbows. March 2009 National Marine and Fisheries Service issued a detailed analysis of reasons for declining Chinook salmon runs in the Sacramento River. Warning: Large PDF File. March 26, 2009 For decades, 60 miles of the San Joaquin River has been bone-dry.Imagine all the instream flow. 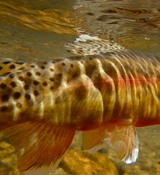 March 12, 2009 California's State-budget-cutting-axe has hit the Heritage & Wild Trout Program.Read the letter from Roger Bloom, CDFG Biologist, detailing the severe impact to this great fisheries program. Experience the pure wonder of fly fishing the Golden Trout Wilderness from the couch. February 26, 2009 In the shadow of Mount Lassen and once home to the Yahi Indians, flows Mill Creek. February 1, 2009 Impressions from a recent trip to Ano Nuevo. December 28, 2008 Dare I say, the best collection of fly fishing essays written -- The Longest Silence by Thomas McGuane. December 21, 2008 Thanks to contributors - Ned Morris (CHTC #5 & #57) and Scott Lyons (CHTC #65)- the EcoAngler has expanded its Angler Honor Roll . December 14, 2008 Kelly Creek is one of the West's Blue-ribbon native trout streams. Without foresight and a change to the fishing reg's things would have been different here -- very different. December 2008 Red Spawn - Midwest invaders continue hatching their plot to push westslope cutts out of their native lakes. November 20, 2008 You are'nt high - You're just steelheading on the Trinity River 2008. November 20, 2008 CalTrout issues a detailed status report of California native fish. Warning: Large PDF File. 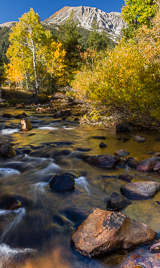 November 9, 2008 Looking for a quiet, small stream experience just outside of Truckee, California? Then Sagehen Creek might be your answer. October 26, 2008 Thanks to Katherine Evatt and Pete Bell of the Foothill Conservancy for correcting my minimum streamflow info for the North Fork Mokelumne River below Salt Springs dam. October 19, 2008 A popular trail with hikers and backpackers leads to the headwaters of the Truckee River - home to a restored population of Lahontan cutts. October 12, 2008 Some photographs of healthy stream-resident Lahontan cutts. October 5, 2008 Just posted my recent Heenan Lake Fishing Report. September 30, 2008 Heenan Lake 2008 Rainbows in Heenan? Unfortunately true - California Department of Fish & Game Biologist confirms my fear. September 21, 2008 Jones Hole Creek slices down a thin, red rock canyon inhabited by rainbow trout and aggressive-wading mountain sheep. September 14, 2008 An excellent, remote fly fishing experience can be had along the high, North Slope of Uintas Mountain Range. August 21, 2008 Fishermen welcome since 300 A.D.
August 14, 2008 Take a look inside what makes the Green River, below Flaming Gorge a proverbial aquarium of fish. August 7, 2008 Occupying less than 5 percent of its historic range within the upper Colorado River watershed, the Colorado River cutthroat is considered to be the most colorful cutthroats and possibly one of the most beautiful fish in North America. July 20, 2008 Flowing through a deep canyon on the West slope of the Sierra the North Fork Mokelumne River below Salt Springs dam certainly looks like a great fishery. July 12, 2008 Rock Creek's spring run-off may have been later and larger than usual this year, but the Giant Salmonfly and golden stonefly hatches produced jaw-dropping and jaw-closing responses for anglers and trout alike. Summer 2008 Coming in July - Fishing a fat Salmon fly hatch on a historic blue ribbon fishery. View some Stone Love. 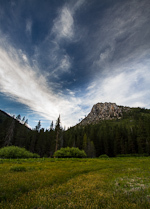 June 25, 2008 The 3rd Release of Fish Eye doesn't disappoint and features one of my favorite Sierra still-water destinations. June 11, 2008 Hiking the Doyle trail upstream along the Tule River leads to a dense wooded canyon with small, eager trout swimming below. May 26, 2008 With Spring run-off coursing through Sierra Nevada streams come hatches of Calineuria Californica and Hesperoperla Pacifica. May 2, 2008 If you're a fan of wild trout and surroundings to match, then the Kings River above Pine Flat Reservior might be your ticket. April 17, 2008 The EcoAngler profiles the lower Kings River. A once great tail-water is on the comeback. April 2, 2008 Added some photos of the lower Stanislaus River along Two Mile Bar. March 20, 2008 A collection of essays (some rants) from a passionate fly angler and writer David Duncan in My Story as Told by Water. March 13, 2008 Spilling over the rim of Goodwin Dam, the the lower Stanislaus River emerges as a wild trout tailwater. February 13, 2008 Putting the spot-light on Caddisflies of the Sierra Nevada. Includes new hatch table for several critical species of glossoma. February 1, 2008 Lou Ureneck fishes through a turbulent childhood, refuses to repeat the mistakes of his fathers, and oh yeah, guides his son and himself down a wild Alaskan river in Backcast. January 17, 2008 Salmon and other finned creatures gain the upper hand in the just released Klamath Basin Restoration Agreement (PDF). January 15, 2008 It's a concrete jungle if you are young, a chinook salmon and your parents dumped you just outside of Merced Falls. December 27, 2007 The EcoAngler pushes the Play button on The Season of the Mayfly - the 2nd Issue from the Fish Eye folk. December 9, 2007 Northern Harriers are agile flyers often seen skimming grasslands while hunting for prey. November 26, 2007 Caption - A Fistful of Tags. Steelheading on the Trinity River can be money. November 15, 2007 The Rogue River is the largest producer of Pacific salmon in Oregon outside of the Columbia River with nearly 100,000 anadromous fish returning from the ocean each year. Apparently the 2007 spring chinook and summer steelhead didn't get that memo. November 7, 2007 The Idaho panhandle is the northern most range of the Westslope cutthroat. In the panhandle flows the Saint Joes River where its upper reaches hold wild and scenic cutthroat. November 2, 2007 Greatly expanded photo gallery of Westslope Cutthroat caught and released in Northern Idaho. October 24, 2007 Posted a gallery of Goose Lake redband photos from a recent trip into Modoc National Forest. October 16, 2007 Looking to catch a Goose Lake redband? Watch where you STEP. October 10, 2007 The Pit River generates lots of power, aquatic bugs, and wild trout. October 1, 2007 In the remote northeast corner of California, up a long and steep forest service road, runs a tiny creek which holds a native redband trout known as the Warner Lakes redband . September 2007 If you fly fish for trout in the West, could Gary LaFontaine's Caddisflies be the most important bug book to read? September 2007 It's official now... California has a water crisis! And we got a web site to prove it. August 23, 2007 The North_Fork Yuba_River fished well through the early summer. August 8, 2007 Spent 6 days drifting, fishing, and exploring the Middle Fork of the Salmon River. With nearly 300 Westslope Cutthroat per river mile it's rich in native trout. July 26, 2007 Photos of wildfire and a helicopter - Two of the EcoAngler's favorite things to watch - from a distance. July 25, 2007 The EcoAngler ranges into the Mountain West for Westslope Cutthroat. July 20, 2007 Looking for another high Sierra setting to fish for Lahontan cutthroats? Consider a trip to Kinney Lakes. July 3, 2007 In a major drive to turn around the downward spiral of the McCloud River Redband Trout, Caltrout in conjunction with the Orvis Company and the NFWS announced a triple matching grant challenge. 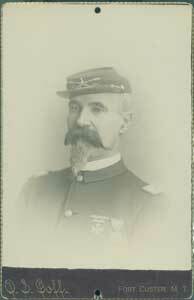 To learn more about this grant challenge, visit the McCloud Redband Challenge. June 25, 2007 Three days and two flies on one of California's most wild and diverse rivers - the Clavey River. June 11, 2007 In the shadows of giants, the EcoAngler fishes the North Fork Stanislaus River in Calaveras Big Trees State Park. May 29 2007 William Tapply shares a collection of fly fishing experiences in his latest book Trout Eyes: True Tales of Adventure, Travel, and Fly-Fishing. May 11, 2007 The EcoAngler explores the Merced River in Yosemite National Park. With a light snow pack, Spring and early Summer will be ideal. May 3, 2007 An overview of aquatic insect ecosystems with a focus on the Sierra Nevada range. 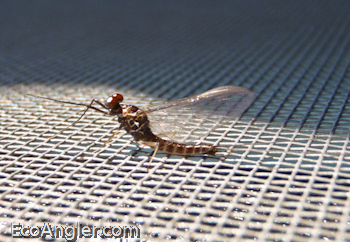 April 16, 2007 Added several key caddis pupa fly patterns important to fishing Western fly waters. March 28, 2007 Buy a t-shirt and help the California golden trout. Patagonia's World Trout Initiative is now sponoring the The Golden Trout Project through sales of this t-shirt. March 27, 2007 The Golden Trout Project needs volunteers for this summer! 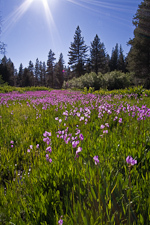 Howard Kern is looking for folks to staff a couple of key projects in Mulkey Meadows in the southern Sierra Nevada. Read here for further information. March 21, 2007 A window of time exists - after the winter rains and before the spring run-off - to fish the Merced River outside the Yosemite National Park boundry. Besides rainbows, the Merced Canyon serves up an amazing assortment of wildflowers this time of year. March 6, 2007 Two chinook salmon runs - one in serious decline on the Klamath River and another completely expired on the Lower San Joaquin River - are profiled in river restoration. February 28, 2007 If you have ever ventured into the Trinity Mountains, steelheaded on the Klamath or Smith Rivers, or stocked native trout in the high deserts of Northeast California, then you'll enjoy the scenery of The Klamath Knot. February 12, 2007 Expanding the Species section with Endangered Listings status of all trout, salmon, and steelhead species in the Western United States and detailed range maps of all the major trout species within the state of California. January 24, 2007 Splitting Cane doesn't realize its full potential to inspire. 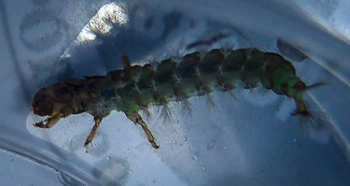 January 14, 2007 Caught the Skwala stonefly hatch, but no big rainbows on the Lower Yuba River. Winter 2007 We're talking bigger, more powerful, trout. 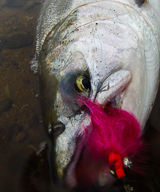 The EcoAngler makes room (and beefs up his gear) for Steelhead with Species description and expanded Habitat coverage. November 21, 2006 Explored a remote section of the East Carson River in the Iceberg Carson Wilderness. November 10, 2006 The best of Fall - fishing the big October caddis hatch on the McCloud River. November 3, 2006 Photographs of the McCloud River redband taken from a creek within the McCloud watershed are now available. October 19, 2006 Expanded the habitat description of Eagle Lake with additional information and photos. October 14, 2006 Added more photos of Eagle Lake rainbows I caught and released. More photos here. October 11, 2006 Have a special place in your heart for native trout? Looking for a good read? Many Rivers to Cross gets a thumbs up. September 23 - 24, 2006 Steelhead are creeping upstream into the Lower Sacramento River. September 16, 2006 Posted my Photos from Heenan Lake. Lahontans in the 16 to 22 inch range, caught, photoed, and released. September 2006 View more photos and info from my recent Golden Trout Wilderness Trip. August 27, 2006 Added some photos of native Kern River rainbow taken in the Heritage Trout Section of the Kern River. More photos here. August 5, 2006 Lake Alpine - Home to an aquatic mob of junk food junkies. July 4, 2006 Caught and released over 10 California golden trout on Cottonwood Lakes including one around 15 inches. July 2006 Read my Hot Creek Chronicle. June 2006 Detailed topo maps are now available for each destination listed under Trout Habitat. 2006.1.21 A trip to the upper Kern River (upstream of the Johnsdale bridge) looking for Kern River rainbow. The Kern River rainbow is subspecies of rainbow trout found only in California. 2005.11.10 The East Walker River within California is open to anglers until November 15th. Low water levels and reduced flow from Bridgeport Reservior made for challenging conditions. 2005.10.29 Attended a clinic lead by Jay Fair and Denny Rickards at Eagle Lake. 2005.10.7 Enjoyed a clear autumn day cruising Heenan Lake. The mid-day proved the optimal time yielding several healthy Lahontan cutthroat in the 14 to 22 inch range.